When I first started to read this book I was extremely irritated with the main character. I mean, when one works in the white house one obviously has to be aware that sensitive security issues are just that, Sensitive security issues. So this charcter just tosses it all out the window and decides to go all curious and stick her nose where it had best not be. I mean, you just don't muck about with that kind of thing. I was so irritated I almost chucked the book. But then I reminded myself that a reader loving and associating with a character is not the only sign of a good book; a good book is also found when the reader passionatly irritated with a character ( as it is another form of connection with the book). And I was most pointedly irritated with dear chef Ollie. I wanted to reach into the book and smack her up-side the head. However, limited by the laws of both physics and reality, I merely sucked up my irritation with the main character's extreme character flaw and kept reading. And I am glad that I did, because I really did enjoy the book. It was interesting, informative, exciting and had me hooked from the first irritating moment the heroine decided to play at being "secret" Secret Service agent chef. 3.5 stars, quite a fun book overall. I loved the DC and Northern Virginia location, and of course the White House. Those locations were all as real as possible, but the foreign delegations were from fictional lands, an interesting choice that I'm sure could be debated, but felt like the right choice for this book which wasn't meant to be political commentary but primarily entertainment.The only problem is that the Ollie suffers from cozymysteritis, closely related to the dreaded TSTL (too stupid to live disease). People with cozymysteritis just can't help getting involved with things that are clearly none of their business and are horribly dangerous, and then handle those things in ways that prove that they may, in fact, be TSTL. But it is a standard in the genre, so I generally only pick at the degree to which my suspense of disbelief made my enjoyment of the story less. Sometimes I can shake my head and move on, other times I throw the book across the room on annoyance. This was much more the former. The book is really kind of half way between a fluffy cozy and a more serious mystery, well written and with some more serious elements, but also with recipes and office politics and lighthearted elements. I like the middle of the road approach of not being too silly or too scary or suspenseful, but it does make for a balancing act. It makes me expect more solid follow-through on plots and for Ollie to be more mature. I would have preferred a more solid reason for Ollie to have gotten involved with this mystery all together. The opening really fun chase scene across the White House Lawn, ending in the big Pan Slam, was a great way to start things off, but the idea that this guy needed the assistant chef's help never made sense. Her nosiness made perfect, if irritating, sense! But she was idiotic to follow-up with him and not trust the Secret Service to take care of matters. What did she think she could do? And when she did the normal cozy novel mistakes to draw things out and add to confusion on their end (but having already giving hints to us as readers) of not giving complete information because she was too embarrassed or didn't want to involve her boyfriend or whatever (like not reporting an attempted break-in to the Secret Service), it was infuriating because it wasn't just her life on the line, it was the President's and possibly many others, not a topic you can just be casual about and certainly not her call to make. I seldom get that worked up in reading about dog walkers or caterers, their mistakes won't change the fate of the world. But in general, she did get caught up in somethingway beyond her "pay grade" as they say and other than a few idiotic moves managed to conduct herself well. The overall story was very readable, with an intelligent and welcoming style that made me feelcomfortable with the characters and their world rght away, like I really was getting a peek into backstairs at the White House. Great culinary series debut! I found it fast-paced and very entertaining. What an interesting setting for a cozy mystery plot--the White House kitchen! Ollie and Henry are wonderful characters, and are supported by a delightful cast of secondary characters. Some you'll like; some you'll dislike. I wouldn't hesitate to buy this book and start reading today! LOTS of fantastic recipes after the story, too! Yum! This book started out with a bang - literally - but then had too many ups and downs to make it a strong read. I give it 3.5*, but did like it enough to get the next book in the series, Hail to the Chef. I'll see how that one goes before I judge the whole series. 2.5**The first in the White House Chef mystery series introduces the readers to Ollie (Olivia) Parus, and the rest of the staff in the White House kitchen. On her way back to work after running an errand, Ollie happens upon a serious breach of security; an apparent madman is running across the White House lawn, pursued by Secret Service. But when the man is on the ground right next to her, he pleads for her help. The Secret Service members she’s always been on a first-name basis with are now distantly professional and she can’t get any straight answers, even from her Secret Service boyfriend. In the meantime, Ollie is in competition for a promotion; she’s up against a TV celebrity chef who is from the same home state as the first family. And to add further stress, the kitchen is given only a week’s notice of a major state dinner. Ollie irritated me no end. Not quite “too stupid to live,” she is annoyingly nosy, especially given her position in the White House kitchen. I had a hard time believing she was a trained professional when she wasn’t behaving professionally most of the time. Her romantic relationship doesn’t ever get off the ground either; they spend all their time mad at one another and not speaking. Hyzy includes a fair number of red herrings … multiple people are described with particular physical characteristics that might make them the lead suspect. One particularly unlikeable character was a lead candidate, as far as I was concerned; at least until he completely disappeared from the book in the last 30 pages. Hyzy also has a tendency to repeat herself; I got it the first time she told me that additional staff would be brought in for a state dinner, or the first time Ollie opined that she was sure the TV chef would get the job over her. I had previously read a later book in the series and gave it 3 stars. The plot in that book was also thin, and despite the framework of the White House Kitchen there is very little emphasis on food. Still, I was reasonably entertained, and decided to go back to the first in the series to start at the beginning. Basically we have a reasonably interesting premise/framework for a cozy mystery series, but not the best execution. I’m not sure I’ll read another. Very much enjoyed this, I love reading about the White House, and having a cozy feel mystery a part of the story, made this a real win for me. Looking forward to reading the second book as soon as I can get my hands on a copy. Olivia is an assistant chef in the White House's kitchen and the heir apparent to take over as executive chef when the the current executive chef retires. With international dignitaries from the Middle East in town and a new Presidential appointee micro-managing everything going on in the kitchen, her job has never been more stressful. Then she stumbles on a plot to strike at the summit and forever destroy any chance for two warring nations to live in peace. And as the only person who has seen the face of an international assassin known only as The Chameleon she suddenly finds herself in the cross hairs. State of the Onion is a text book example of what a cozy mystery should look like. Honestly, it's a hoot. Seriously good fun. This is the first in the White House Chef Series- and after only 50 pages I was hooked not just on this book but I knew I was hooked enough to read the entire series. I love Ollie- the main character- she is strong, independent and exciting. She works in the White House which is an exciting place to be. This book is full of heads of state- secret service men- and yummy sounding food. And as all good cozy mysteries- kooky characters and a few surprises. This is an easy read with some appealing characters. The main character is an assistant chef in the White House who is caught up in a mystery when she is accosted by a man who is trespassing on White House grounds, Much of the story takes place in the White House kitchen and you get a glimpse of what goes on at State dinners. There is also an assassin, The Chameleon, who is stalking her despite her pleas to a Secret Service boyfriend to protect her. You might also enjoy some recipes at the end of the story which have been used in the White House. Overall, a very good story. I was positive I knew who the killer was until the very end, when I was proved very wrong. All the characters in the white house kitchen were likeable and I enjoyed reading about them. There were a couple of times when the main character waxed lyrical about the honor of working in the white house, and while I understood the feelings the author was trying to convey, it felt a bit over-the-top. The only place I felt the author failed was the relationship between Ollie and Tom. His treatment of her throughout the story felt wrong for someone who was supposed to love her and didn't endear me to him at all. And his complete 180 wasn't explained at all - one minute he was so mad at her he couldn't even talk to her, and the next, they're hugging and he's grinning and talking about never letting her go. huh?Overall, though, I enjoyed this book and I'll gladly pick up the next in the series. Ollie Paras is a White House chef who hits an intruder upside the head with a frying pan. He says he's trying to warn the President of some plot. She has a Secret Service boyfriend who is a jerk. She is also competing with a cooking show host for the job of Executive Chef. None of these plot-lines are fleshed out well enough. Most characters aren't either. An enjoyable read, but no substance and easily forgettable. Yummy sounding recipes in the back! Also, a lot of plot points went unanswered. Who was Naveen really? Is the princess really allergic to nuts? What was that all about anyway? What was the princess's deal? Why was Tom keeping their relationship a secret anyway? Is he ashamed of her? Is it really against regulations? Etc. etc. State of the Onion (pun on State of the Union) is a cute title. Olivia Paras lives up to her motto "Never let them see you sweat". She is an assistant White House Chef with big dreams of becoming the executive chef. We soon discover she gets more than she bargained for when she disovered what she thinks is a would be assassin sprinting across the White House Lawn trying to get to the president and to stop him hits him on the head with a frying pan.She soon witnesses a murder and a assassin is now hot on Oliva's trail to try to see her fry for good. As Olivia is competing for the executive chef position with a long time rival, We can only wonder if the assassin will find her.I was hooked from the first chapter, never a dull moment, could not put it down. As a big fan of culinary mysteries I loved it. Can't to read the next in the series. Thank you so much, Julie Hyzy, you are one talented writer. I normally don't read mysteries, and I really don't read cosy type mysteries, but this one was kind of fun. I like it the more I think about it, although I wish I could give 1/2 points, I think it deserves more of a 3 1/2 then a 4. But what ya gonna do? I didn't figure it out before the ending either, AND the ending was plausible (I hate it when the ending is just SO far fetched, and you know the author did it so you couldn't figure it out). So I liked this one. I kind of want to read the next ones, although I must say I thought the best parts were the kitchen parts and not so much the mystery parts. Not a bad little book. I know this series has been out for a while but I really enjoyed this first in a series. I look forward to reading the rest of the series. The characters and the setting are great. I greatly enjoyed this look at the culinary efforts behind the scenes of the White House. Combine this with the hunt for an assassin and the workings of the Secret Service and you're onto an easy winner. Our heroine is the second chef who is hoping that she can be elevated to first chef when the gentleman in that position retires shortly; however, walloping an intruder with a frying pan draws far too much attention of the wrong sort, as she discovers, and her personal and professional lives are in suspense. Not to mention, someone now wants to kill her. Tremendous fun, insights into the lives of the First Family and State banquets, plus the delicacies of preparing meals for Muslim heads of state. What could go wrong? Maybe an over the top cranky TV chef? I had a good laugh. Find some recipes at the back for food that many of us would actually eat. If this was a technothriller we would find far more cellphones and CCTV in place around Washington but the book was written in 2008, maybe the more recent ones feel more up to date technically.This is an unbiased review. This is the first book in the White House Chef series. Ollie Paras is the assistant white house chef who is in line to be an executive chef when the current chef, Henry, retires. Ollie is on her way back from picking up the retirement present for Henry when she sees a man running across the white house lawn. As he gets close to her she hits him with the gift, a frying pan. When the man contacts her and asks her to meet him, Ollie ends up being a witness to his murder. While Ollie is tangled up in the investigation , she and the staff have the task of preparing and cooking for the state dinner.I enjoyed this book. Ollie was an interesting character and I liked the sub characters. I felt that the mystery was secondary and that there wasn't much investigating going on. I enjoyed the rest of the story though so I might read more in this series. What a wonderful find! This book is so much more than just a cozy. At first I was a little put off when I read in the foreword that the author thanked the NRA. I thought maybe there would be a bunch of politics, but no!The story was thrilling, yet still obviously a cozy. I did wonder what happened to a few of the characters at the end. But since it was the first in the series, I'll give the author a break.If you like intrigue AND cozy mysteries WITH a dash of cooking, this is a great find! 4.1I was surprised by this book. I admit that I had judged the book and the title and shrugged and kept walking. I came back to it on a whim and I'm glad I did. The characters and the pacing kept me interested and the mystery kept me on my toes.I will have to complain about the redundancy of some phrases and "emotions". When Ollie is worried about something there are other ways to express her emotions other than using the same general gist of what was said the last time she was worried (I do not have the book in front of me to pinpoint those phrases but they were there). Other than the repetition, I had no other qualms with this book.Ollie is the assistant chef to the Henry, the Executive Chef at the White House. She's a nice woman, which is a little odd to find in a cozy mystery because there is at least two things wrong with the main characters (usually commitment or social issues)not so in the case of Ollie. In fact, it's her niceness that tends to land her in trouble. Now, when I say she's nice I do not mean bland. She's got a little spice in her! However, while not a complete pushover, she doesn't speak up for herself nearly enough (I mean, I would have punched Sargent in the face before storming out and complaining to Paul, but then, I guess that would make me a "normal" cozy mystery character). She's in a serious relationship, has a job she loves, seems to care about her family and is amiable enough to have many enemies.That is until she witnesses a murder.Then everything starts to unravel. She has an enemy who is trying to kill her, a rival trying to take away her job, her serious relationship beginning to fray (and I'm very mad that this happened which makes me hope that Tom takes a flying leap at some point if he doesn't shape up) and on top of all that, she has a state dinner to plan in a very short time.Ah, the life of a cook.With all that going on, it still kept me interested. I was invested in Ollie and knowing that she isn't a detective or a wannabe detective (in fact, she is pretty okay with staying out of things) but can still take care of herself made Ollie a strong character. However, I think her shock over the deaths (especially the (view spoiler)[ Chameleon(hide spoiler)]) should have been a little more dramatic. I mean, she was a bit too blase about it even though she kept saying that the horrible scenes were burned into her mind. I would've liked to "see" that more.The supporting characters were interesting and they have room to grow, I didn't really get attached to any of them but with the continuation of the series one can only hope. Also, I am hoping that the First Family have more of a role in this series and not just props for Ollie's adventures.All in all, a good first book in a series and I plan to continue on. I was contemplating going to a writer's workshop this summer and this author is one of the individuals giving a seminar. Since I have a guilty pleasure of reading mystery books that also contain recipes, I thought that I would love this book finding yet another series to read through. But, unfortunately, I just did not find this book as fun as I was hoping.One of the things that really irritates me while reading is if the main character, male or female, is completely ditzy and irresponsible with their crime solving actions. The main character here, Ollie, has both of those traits. I was hoping that my love to cook, and eat, would be enough for me to have a connection with her, but I was not able to find her interesting enough. That lack of connection was one of the main problems I had while reading this book.The book itself is a very quick read and I was able to get through it in a few nights. Julie Hyzy does a good job with plotlines and it seems to have enough twists and turns to get you through. In the end though, I found it a little lacking in reality. An assistant chef at the White House takes down an assassin and then thwarts off several other attacks on her life while trying to find out who the murderer is. Something tells me that the White House Security would never have allowed her to muddle in national security issues and at some point she would have ended up in jail. That is just my own assumption and perhaps that would have made an interesting plot point in this story.Overall, it was a good read. Not sure it has peaked my interest enough to read the rest of the series, but it was a good read nonetheless. If you need a little more action and intrigue in your mysteries, then I would probably skip this one. If however a straight up cozy murder mystery is your cup of tea, then put on the kettle and give this one a try.Rating: 2.5 out of 5I borrowed this book from my local library and was not asked to do a review of this book. A White House Assistant Chef foils an assassination attempt and takes it upon herself to solve the mystery surrounding it. The book was readable, and I will probably read later entries in the series because I am a completist; however, there were serious problems, in my opinion, to the book. One, parts of it were entirely implausible. For example, there is a possibility that you are the only person in the world who can identify an internationally sought after assassin. There is no way that you will be sent on your merry way with no protection whatsoever. Some agency, the police, FBI, secret service, or name a dozen other government agencies would, at the very least, send you home with a protective detail if not take you into protective custody. If approval for two individuals from a television station are granted access to the White House kitchen, only those two will be given access even if they show up with more people saying its "necessary" for filming. No one gains access to the White House kitchen without being fully vetted by the Secret Service. Two, at times the descriptions of food and cooking were unnecessary and took away from the narrative. Other mystery/food series, such as the Memphis BBQ mysteries, manage to weave in the food organically. Here there were times when I felt as though the author artificially stopped the story to insert an episode of Ollie cooking or description of the food especially in the first third of the book. The later half of the book during the preparation of the State dinner food and cooking was thoroughly integrated into the narrative, so it did not feel as though it interrupted the narrative pacing. Because the second half was better than the first, I will read the second book in the series in the hopes that the plot does not hinge on an incompetent secret service. This is the second mystery title that I have read by Julie Hyzy; the first being Grace Under Pressure, the first in Hyzy's Manor House Mystery series. I found both books highly enjoyable, but Onion edges out Grace by just a hair. Maybe it's because I'm a food junkie. Maybe it's because my first trip to Washington D.C. captivated me and sparked a deeper appreciation for history. Maybe it's just that Julie Hyzy is a darn fine teller of tales. The main character and narrator of Onion is Oliva Paras - Ollie. I found her to be a very well-rounded character, and one who I liked almost immediately. Through Ollie's eyes, I entered the White House kitchen as well as Camp David. And it was from Ollie's point of view that I assessed the suspects. It was a very comfortable, believable, and entertaining perspective from which to take in the mystery.Ollie's surrounded by a memorable cast of characters and I found it quite easy to navigate through their introductions, something I've sometimes had trouble with in other mystery books. There always seem to be so many characters - good and bad - to keep track of and get to know. But Hyzy's cast in Onion is both substantial and manageable. The plot was a murder mystery, yes, but with a touch of espionage that was quite exciting. As you can see, there are several other titles in the series - not to mention three additional titles in the Manor Mystery House series, as well - so I have a lot of reading ahead of me. I hope you'll join me in the kitchen! I blazed through this book in a day and a half, and for the most part enjoyed it. Ollie is ditzy yet headstrong in the way cozy mystery heroines typically are, but her role as a White House chef adds some interest in her characterization. None of the other characters are particularly fleshed out but they serve their purpose just fine and I get the feeling their personalities will be given more depth throughout the series. Plus one for the hilariously entertaining “villains” that put Ollie’s career in jeopardy, minus one for the tiresome and weirdly sanctimonious Secret Service boyfriend.I don’t want to be the person who gripes about the nuances of cultural sensitivity in a cozy with recipes at the back, but I feel that there’s some regrettable depiction of admittedly fictional Middle Eastern countries here. Most glaring of which is a banquet scene where Ollie sees the wife of a king covered from head to toe and attended by several women. She asks who the other women are and is informed that they are the queen’s handmaidens. At this Ollie reacts with, “Handmaiden? What is this, the Middle Ages?” I know why it was done–the observation pointed to an important clue–but still. Reading that passage literally made me cringe.Read more of this review. I decided to read this book because the other White House Series I read (Flowerbed of State (A White House Gardener Mystery, #1) From Dorothy St. James) which I gave 2 stars because it was not my style and it wasn't a good read in my opinion. I read that others highly recommended this one, so I decided to give it a go.The start made me doubt a little, but I got sucked in quickly and it was much, much, much better than the other one. The writing, the style it all makes for a much more pleasant read. The crime and story line are great! All along the lines I was wrong with my thoughts of the criminal. Next to the crime we also have some insight in the personal life of Olivia Paras. It doesn't take up the whole story but it also isn't incredibly minimum. I like to know more about a character, but also the crime/mystery and I think this book has exactly good enough of both. It is well balanced.The characters are all good introduced and very like able, except for White House Sensitivity Director Peter Everett Sargeant. From the moment he arrived in the book I disliked him. But then again, you always need that one character that gets on your nerves, but never should it be the leading character. Pretty standard cozy mystery - the only difference is that this book treats the White House kitchen as any old kitchen where random people can walk in and out with no trouble or even permission required. It also has a ditzy heroine, who I wanted to brain with her own skillet at the beginning, but then I sympathized with her. Really, she has a tough enough job being girlfriend to the idiot Secret Service man who seems least concerned about listening to poor Ollie, even when he knows she might be the only one who can identify an assassin. No, his ego is too big for that. Bugger him. When it turns out that he's the fool, he just waltzes back into Ollie's life (after having dumped her when the going got slightly tough for Mr. Tough Guy). I surely hope she finds a different eye candy in the next books, and gives this guy a boot.The mystery is pretty obvious. We can point out the creep in question the minute he walks in from stage left. But that's never the problem in cozies is it? I mean, these ditzes need to figure it out after all. I'll be reading the rest of the series though, to see righteous Ken doll get his just deserts. 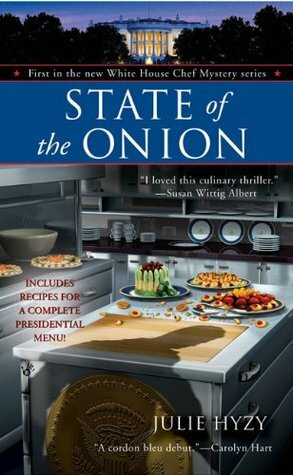 State of the Onion is the first book in Julie Hyzy's White House Chef series. If you like knowing about the inner workings of the White House kitchen and the tv series 24, these might be the books for you. It's not only entertaining, it's educational as far as understanding a little more about how our government entertains and is protected by the brave men and women of the Secret service. It's exciting and makes you laugh. What's a cozy without a little romance? Well you won't find out in this series...because there's a touch of that in it to. Well done Julie. Now I'm hungry for the next one. A fun cozy mystery. A bit improbable but, it's fiction and was easy to get wrapped up in the story.Ollie sticks her nose where it doesn't belong and finds herself the mark of an assassin. She can't seem to stay out of trouble -- chased by the assassin, her boyfriends (a Secret Service Agent) anger over her involvement, the wrath of a snooty White House staff member and the Snobish Chef who is also auditioning to become the White House Chef. The story moves at a pretty good pace and I look forward to reading more in the series. State of the Onion was this month’s read for the Cozy Mystery Corner on Goodreads. This was an okay cozy mystery, more action or tension than the average cozy and less character development. I think this is mainly due to the White House setting and all the attendant security and political issues. The book was well written and paced, however some of it seemed to push hard at the boundaries of belief suspension. Many readers do enjoy this series and so I am inclined to give it the benefit of the doubt and think about reading another in the series. This was a nice cozy read. The mystery is easily predictable and at the beginning of the book the protagonist is very irritable. There were a couple of instances that I thought, "That wouldn't really happen." With that being said, I still enjoyed this book. I really liked learning some of the ins and outs of running a kitchen for the White House.Ollie is an assistant chef for the White House and is competing for the position of Head Chef when the entrance of an intruder on the grounds begins the ensuing mystery plot. Despite a few editing errors - a la missing a word here and there - this is without a doubt the best no-gore action thriller I've read in a while. The mystery takes a back seat to the action and the characters and that doesn't feel at all wrong in any way. It's an action packed can't-put-it-down read! One of my top reads of 2008.